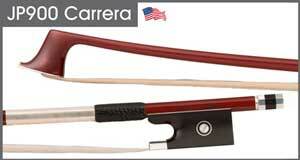 The JonPaul Carrera violin bow is hand made in the USA. Features include: one-piece limited grade carbon composite round stick, silver mounted frog, silver lapping, and a faux lizard grip. Available in full size violin.